After our marathon big bike trip Fanny and I did a few “mini” motorcycling adventures in the Mekong Valley and around the Indo-China region. 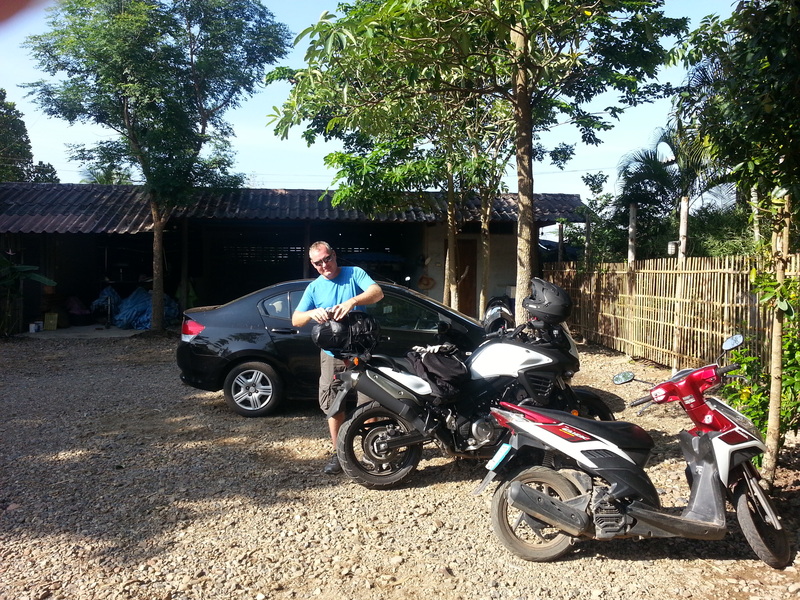 First, Thailand, a superb country to motorcycle around and very much geared up for both the adventurous or idling tourist. First, I managed to escape from Hong Kong and catch a cheap “Air Asia” flight to Bangkok where I hired a Kawasaki Versys 650 to tour around the country for a couple of weeks. My intention was to ride up to Chang Mai and ride around the Mao Hong Son Loop or perhaps further north and ride the Golden Triangle loop, but I realized I made a mistake by flying to Bangkok (which I did because it was cheap) instead of flying directly to Chang Mai and so I changed my plan and decided to ride around the south of Thailand and do some island hopping. 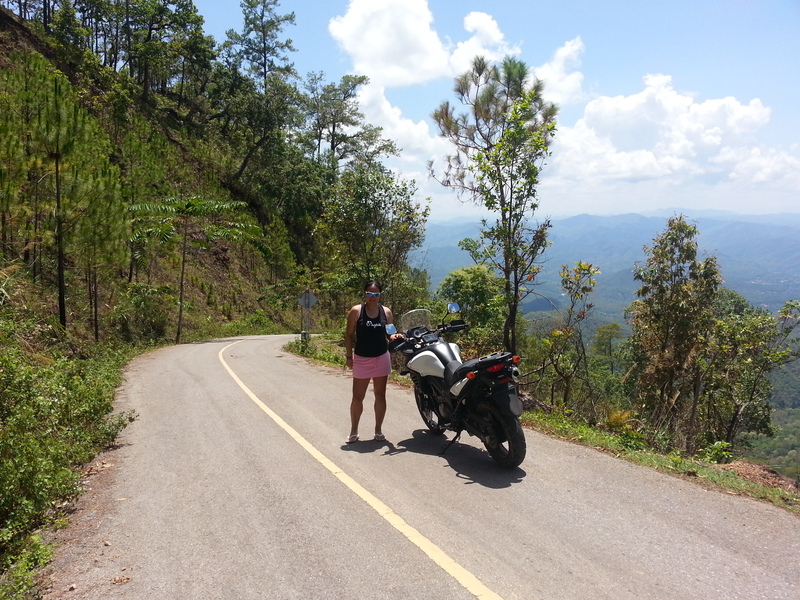 Later in the year Fanny and I flew to Chiang Mai and hired a Suzuki VStrom 650 and rode the 600+ kilometers around the Mao Hong Son Loop which I have to say is one of most enjoyable rides I have done. Not technical apart from lots of switch back turns, but great fun and wonderful views. Thai biking kit … better than most riders for sure. Unlike their African cousins, these Asian elephants didn’t try to charge us as soon as they saw or heard our motorcycles. Riding a very decent Honda Zoomer scooter around Chinag Mai… why not? Our hotel for a night or two in Chiang Mai. Not bad at all. 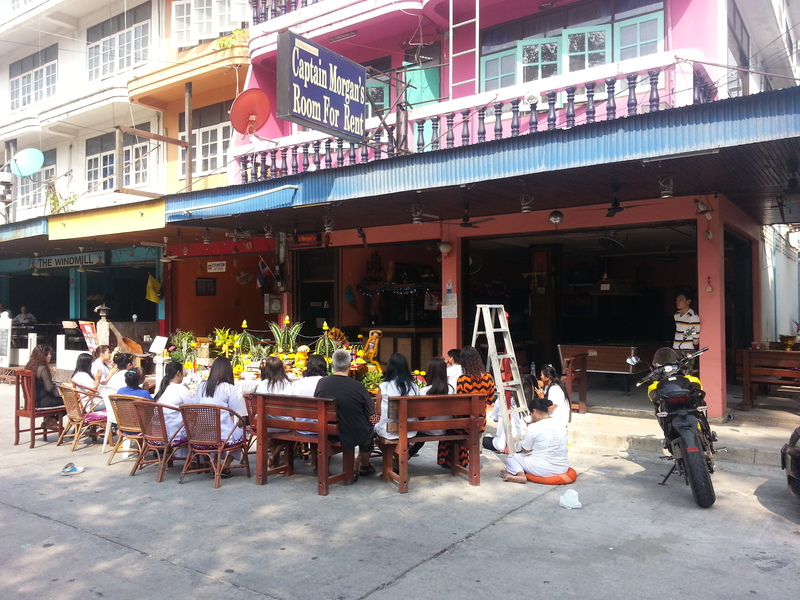 The Thais always seem to do things with some style and charm….. unlike their modern Chinese neighbours, most of whom are complete strangers to the concept of style and good taste… and rubbish bins. Bueng Pai Farm, Pae, Thailand…. thoroughly recommended. Empty resorts due to Thai military coup… this one very up market and surprisingly cheap. Bit odd being there on our own with 30 odd staff. On my solo trip of southern Thailand I wanted to catch up with an old buddy from my Metropolitan police days, PC 673X (if I remember his number correctly) who had retired to Pattaya with his Thai wife. “Blackie” and I used to crew the X-ray 2 area car back in the early 80s and respond to 999 calls which meant Blackie hurling a “jam sandwich” SD1 Rover at break neck speed through the streets of Ealing and West London and me hanging on to a doner kebab in one hand and gripping the police radio in the other as I gave a running commentary… or tried to. In those days we chased the car thieves and robbers until we either caught them or they wrapped their stolen vehicle around a lamp post. No match for Met police class 1 advanced drivers like Mr. Black in hot pursuit. Back in the 80s Londoners were quite alert to the occasional area car driving at 100 mph along the pavement with “twos and blues” blaring. I am not sure if British police are allowed to chase robbers and car thieves anymore. It’s probably against their human rights. I expect nowadays with the gormless internet generation permanently bent over and absorbed in texting on their iPhones as they shuffle along that such a car chase down Ealing Broadway would be akin to 10 pin bowling. And health and safety? It hadn’t been invented yet. In those days only lolly pop ladies and Gary Glitter wore hi viz clothing, Benny Hill was on the telly and Maggie was in charge. Suffice to say, with all these “look back” inquiries into the antics of pretty much everyone back in the 80s I am going to leave it at that. PC 929X Utley with X-ray 2 Area Car early 80s. Evolution …. its all downhill from here. 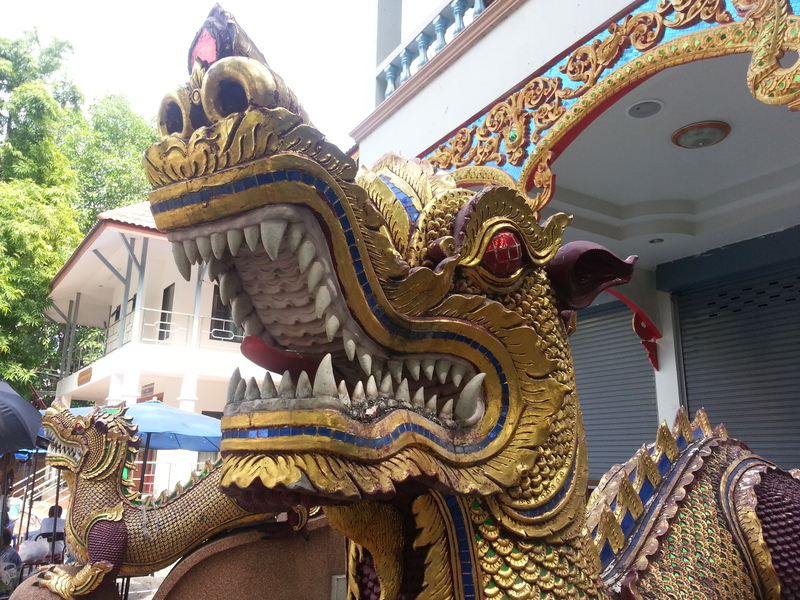 Pattaya…. looks nice from a distance. 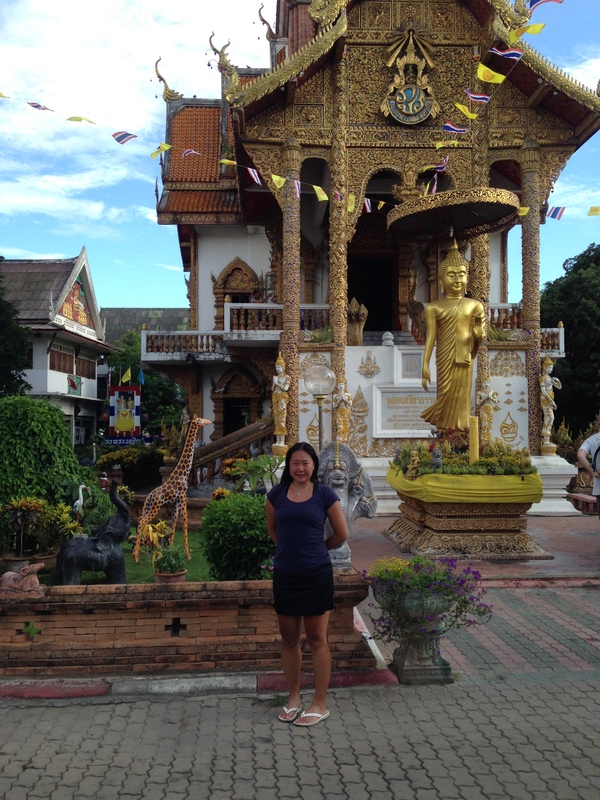 A little bit over the top….. where are all the temples? 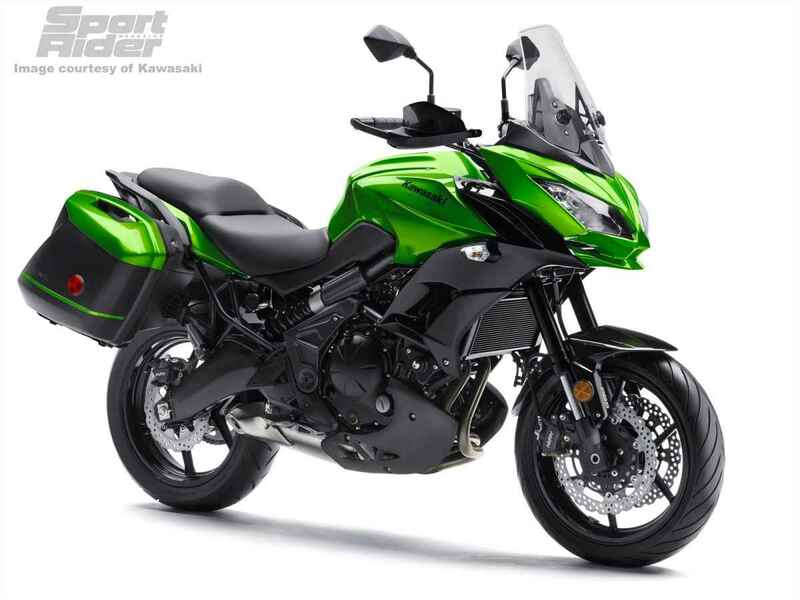 New 2015 Kawasaki Versys with improved headlight cowling. 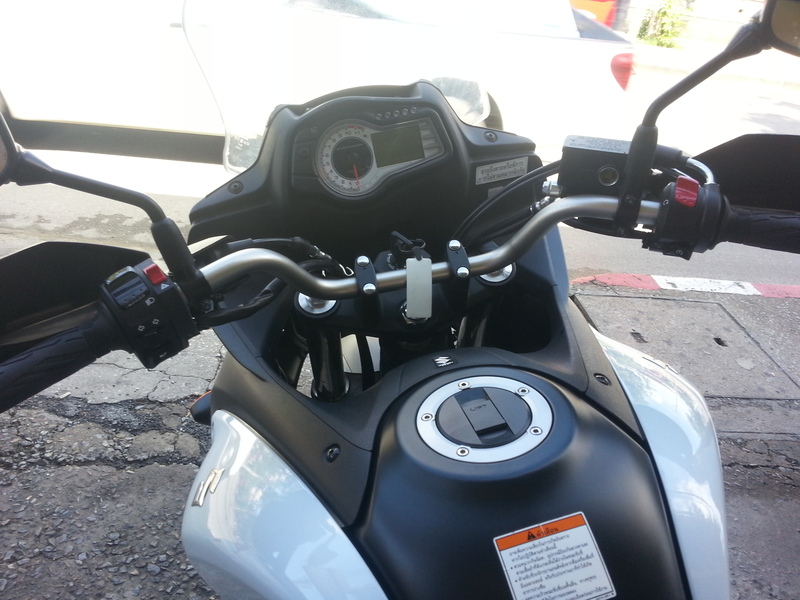 The old Kawasaki Versys, like the one I hired. I had been to Phuket many times back in the late 80s when it was actually quite nice, but never to Pattaya. I’ve got nothing against hookers, disco bars, or middle aged men (I is one after all), but its just not my cup of tea or coffee or anything really. 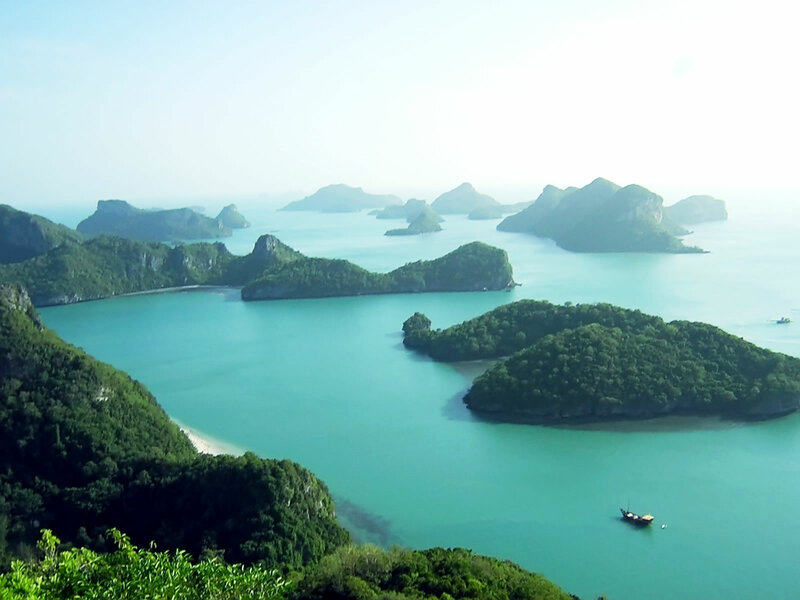 There are so many beautiful places to go in Thailand and the rest of South East Asia, so why would you go? Anyway, I collected the Kawasaki Versys 650 from Bangkok Bike Hire and aimed it in a sort of southerly direction which isn’t that easy in the heart of the bustling and chaotic metropolis of Bangkok. I was immediately surprised at how quick, agile and comfortable the Versys was. Not bad at all. I had been given the 2013 version that has a twin cylinder 650cc engine and ABS, but strangely adorned with an ugly cyclops headlight arrangement protruding from the cowling that in my humble opinion spoiled the look of a very capable bike. 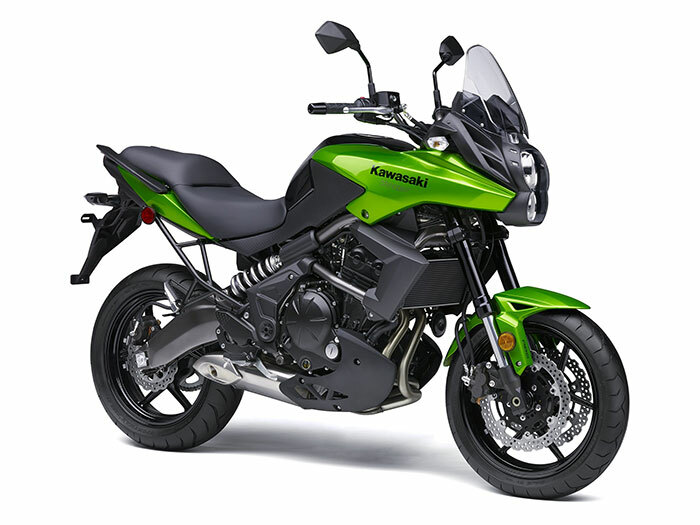 I guess due to this negative feedback from many other people the new 2015 model has been restyled and has a vastly improved cowling in keeping with current Kawasaki styling, including an adjustable touring windscreen. Like many cities in Asia, riding a motorcycle in Bangkok is just as treacherous, if not the most, and you need to be very cautious and very alert to the other fools on the road, of which there are many. Apparently, like in China, motorcycles are not allowed on the highways, but unlike China its difficult to know what’s a highway and what isn’t. The signs to get out of Bangkok, or go anywhere else were truly awful and the road construction, diversions and elevated flyovers meant you couldn’t be sure where you are and so it was very easy to get funneled into the wrong lane and into one of the frequent police road blocks manned by Thailand’s finest. Like much of South East Asia, it is very fair to say that the police are completely useless, AND extremely corrupt. I got stopped fifteen times on this particular ride for nothing more than being on a motorcycle, nearly all around Bangkok and given the shake down for a bribe. But as always I stood my ground and in the end they just let me go. I have never paid a bribe in my life and have zero respect for anyone who does. It took a couple of hours to get into Pattaya, which after escaping the sprawl of urban Bangkok and having to ride under the elevated highway on uneven roads for a large part of the way was actually pretty easy, if not a tad boring. 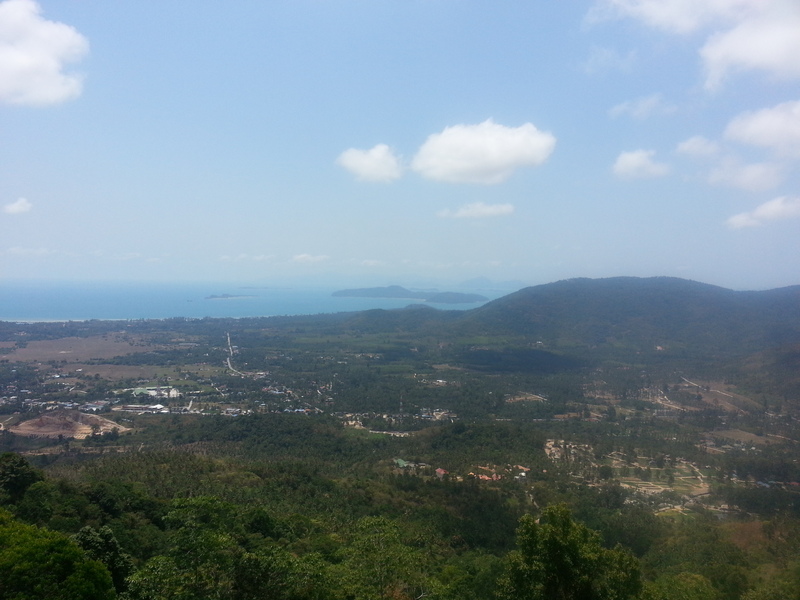 Nothing much to see along the way, commercial sprawl and by no means a pretty bit of Thailand. Pattaya is a huge sleazy party town on the coast just south of Bangkok and the first thing I noticed when I arrived were thousands of thuggish looking Russians with their glum looking “Katie Price” girlfriends milling about looking predatory and loutish. As Fanny and I saw all too often in Egypt these new upwardly mobile Russians all appeared joyless, unfriendly and damned right depressing. There were also thousands of middle aged and repulsive looking European men sitting in bars, or waddling hand in hand with girls a third their age. I presume they weren’t walking them to school! And then there were, more surprisingly, regular family groups who for some reason or another had decided to go to Pattaya on holiday. Why? Who knows? With the possible exception of Gaza, Luton and the Islamic State of Iraq and Levant, its got to be the most inappropriate place on earth to bring your children on holiday. But each to their own. I met my friend Blackie in one of the many coffee shops along the sea front and he looked almost the same as he did in the 80s, except for being a lot more tanned. I followed him on his Honda moped back to a residential part of Pattaya where he lived with his missus. After using me as an excuse to go out, we did some sight seeing that involved copious amounts of Chang beer, and types of beer, blurry neon lights, ping pong balls and balancing on the back of his scooter shitfaced. As with many of my activities with Mr Black over the last three decades the “Kai Tak Convention” prohibits saying any more. After an early start the next day, a Thai noodle and egg breakfast and a very detailed briefing on where to go and what to see from my friend I headed off to Koh Chang. Mr Black is also a biker, extremely well traveled, has ridden across India and Nepal on a Royal Enfield Bullet, and his recommendations and observations were spot on and very useful. Unimaginatively, and perhaps a little confusing, Thailand has two “Koh Changs. One is off the west coast and one near the border with Cambodia. 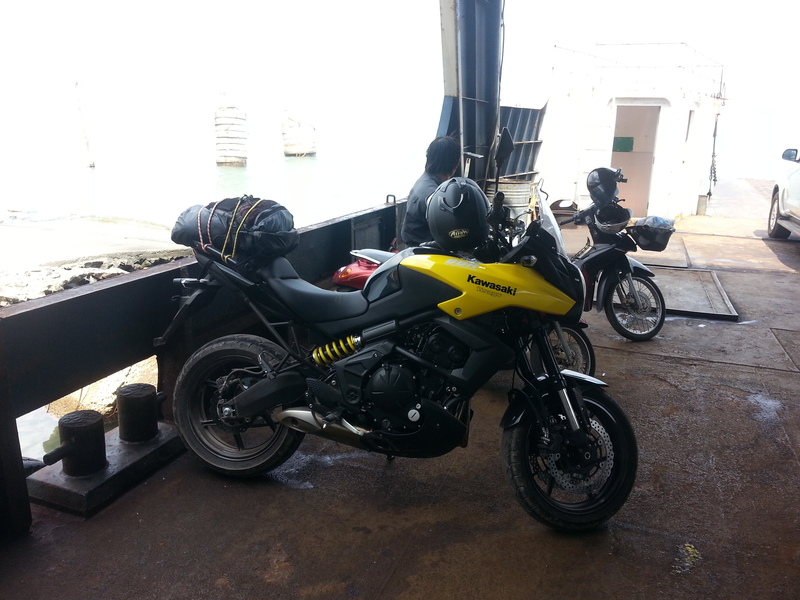 I went to the latter which involved a two hour bike ride and an hours ferry ride from the coastal town of Trat to the island. I highly recommend Koh Chang. Of the four islands I hopped across it is perhaps my favourite. After exploring the island’s tracks and trails on the very capable Kawasaki Versys I found an idyllic spot on the less developed north east side of the island next to a perfect beach. 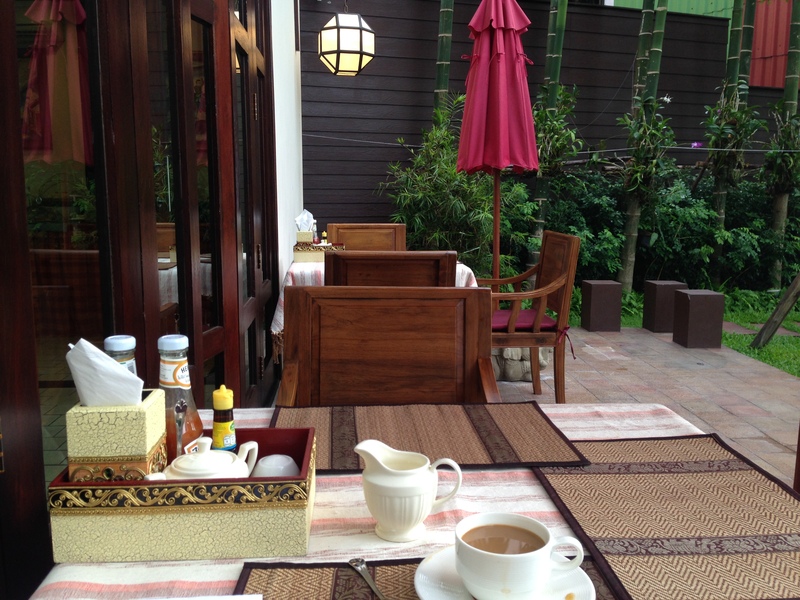 It was much like the best places I have stayed in South East Asia. No electricity, a very simple thatched beach huts with a little veranda on stilts, a simple bed covered in a mosquito net, and facing the sea. In fact at high tide the sea came right up to the hut and nothing beats the soporific sound of the breeze rustling through palm trees and the gentle lapping of the waves. 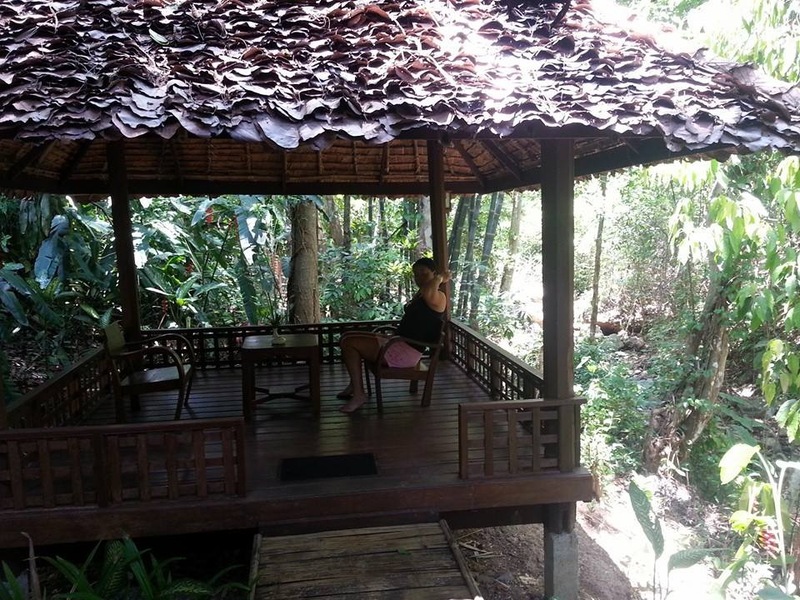 There was a larger thatched building nearby with a kitchen and a common area with hammocks and easy chairs where you could get local Thai food and tourist fodder like banana pancakes and smoothies. It was very good book reading and mellowing out territory. A big thumbs up. 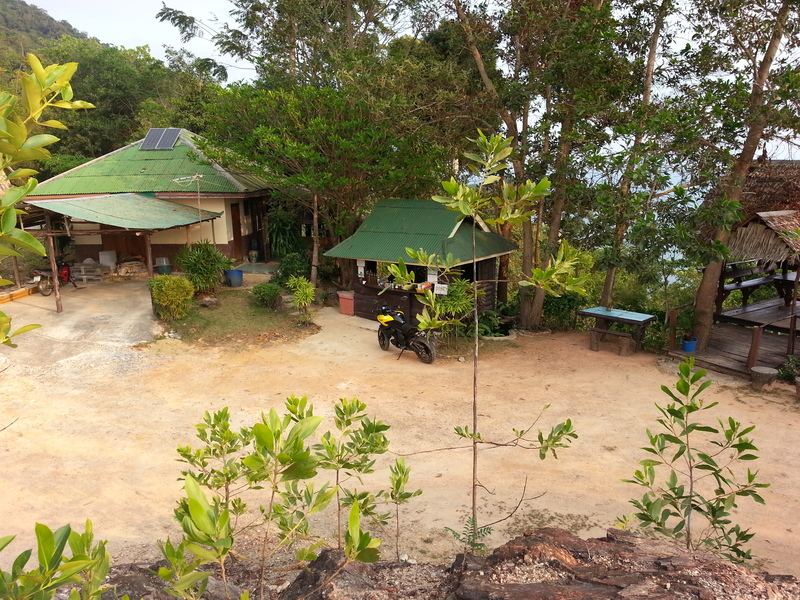 The main place with hammocks and a kitchen full of food and beer…. right on the beach. Home sweet home…. my hut for a few days… what more do you need. Slept perfectly. 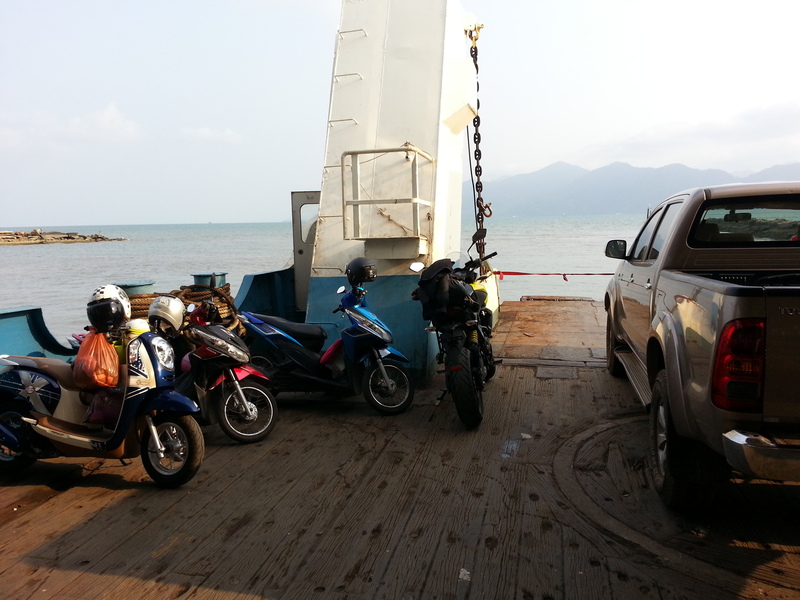 Out on the Kawasaki for an explore around Koh Chang island… resisted the urge to ride down the river bed. Every scratch costs. One afternoon while wading about in about eight inches of seawater I got stung on my ankle by a stingray. Apparently they are quite common in such waters and its easy to inadvertently tread on one as they are well camouflaged against the sand. I can’t begin to describe how painful it was and I actually thought for a while that I might die. An over reaction, but my landlady came to my rescue and I had my foot plunged in almost boiling water that was actually less painful than the sting. Despite the excruciating pain, I was told the sting had only grazed my ankle bone and was lucky it hadn’t penetrated further. The hot water actually breaks down the structure of the poison and so the pain from the sting eased off steadily over the next few hours, but I was left with a throbbing lower leg for about 3 weeks. Moral of the story… don’t tread on a stingray… they sting. 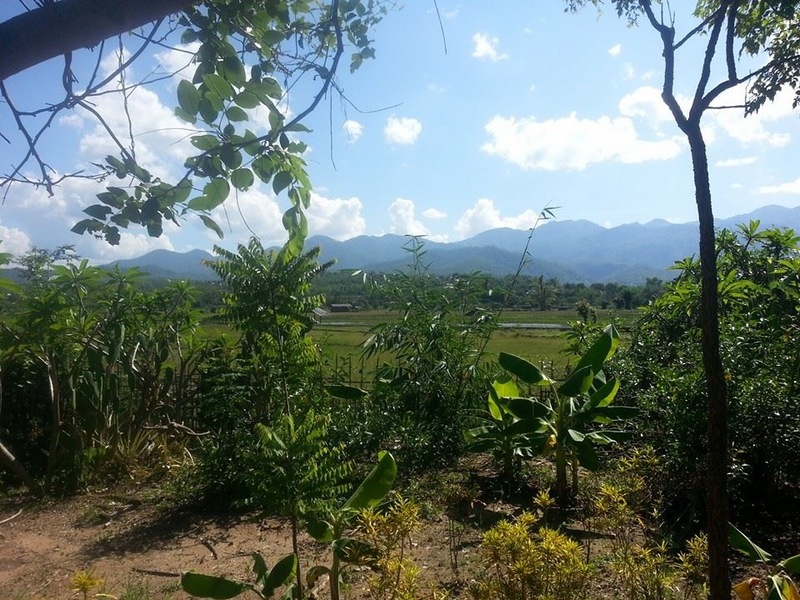 I explored the island for a couple of days, going off road and climbing trails, visiting little villages and remote beaches, and then decided to ride back to the mainland and ride north along the border of Cambodia and through the villages and small towns and head back in the general direction of Bangkok through the eastern hills. 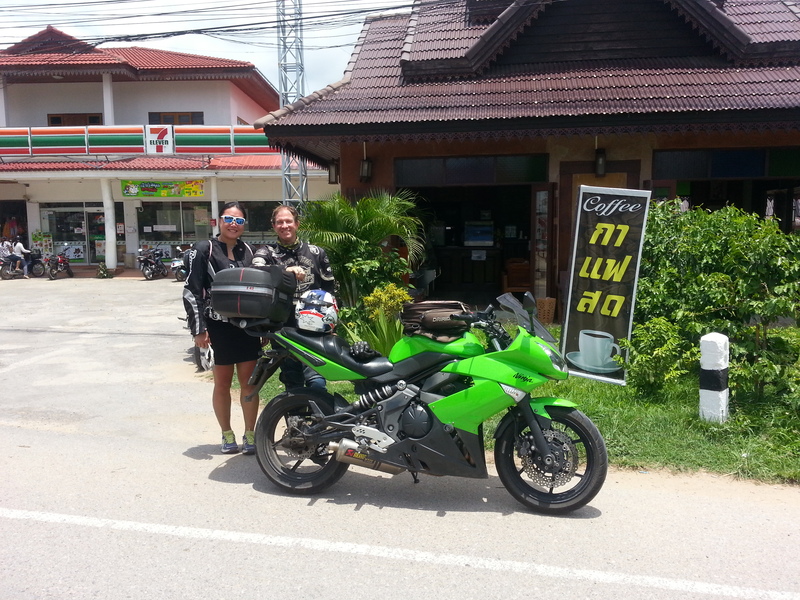 I had originally planned to keep the Versys and ride to Koh Samui, Koh Tao and Koh Pha Ngan but decided instead to fly and then hire a smaller bike when I got there. 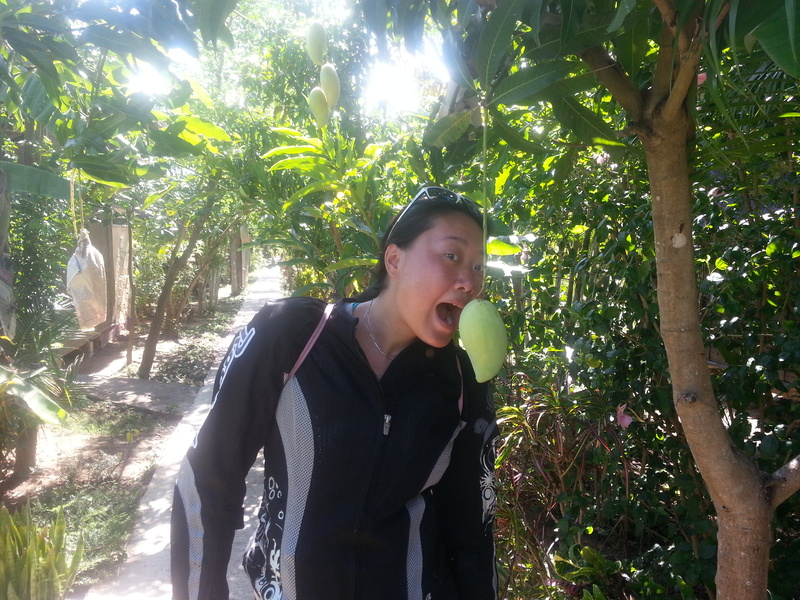 The ride back to Bangkok was excellent and I managed to find what I was looking for. 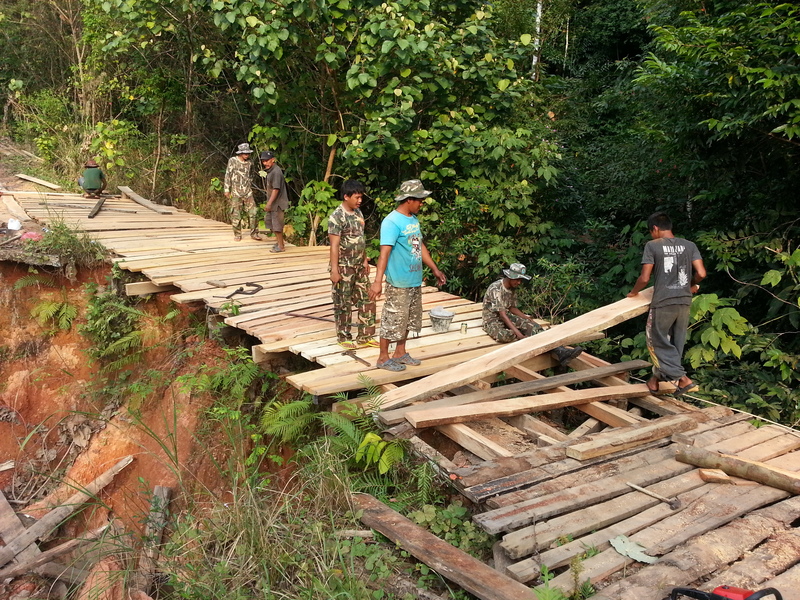 Jungle trails, mountain roads, forests, and remote villages. In the cities and tourist areas the Thai food is mellowed down like it is in Thai restaurants in London and other western cities, but the secret to getting the authentic deal is to ask for “old man’s tom yam gai” or “old man’s papaya salad” or whatever and then you get the highly spiced and original hot dishes. They always asked me if I was sure this is what I wanted and studied me carefully as I tucked into the chillies with sweat dripping profusely from the tip of my nose into the bowl of food. In the hills and small villages there were street side hawker stalls and little restaurants selling bags of red and spicy chai tea and a smorgasbord of Thai specialties like Pad Thai, Tom Yum, and fruit. All excellent. 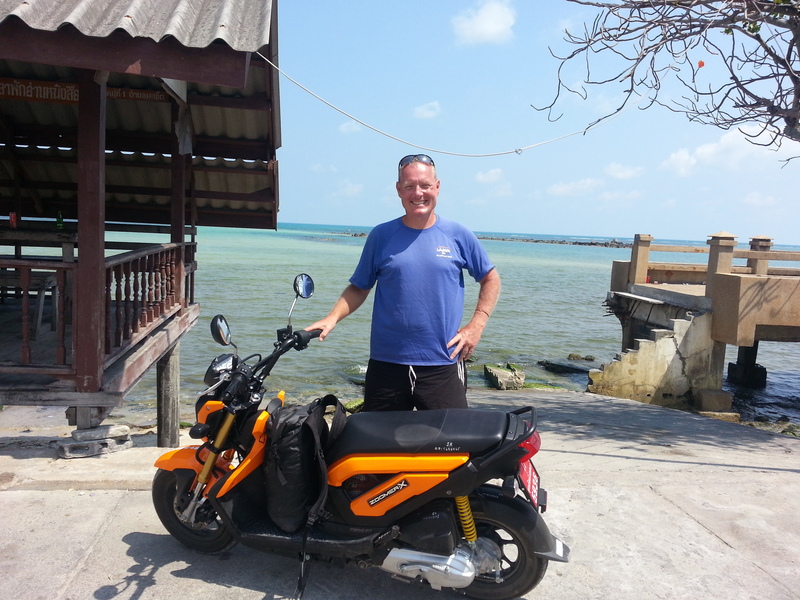 I eventually got back to Bangkok via the scenic route, although the last 50 kilometers were through the usual traffic chaos and returned the bike early and made my way to the central city airport to get an Air Asia flight to Surat Thani. Quiet coastal locations that only a bike will get you to. I was traveling extremely light and only had a small rucksack, just as I like it. 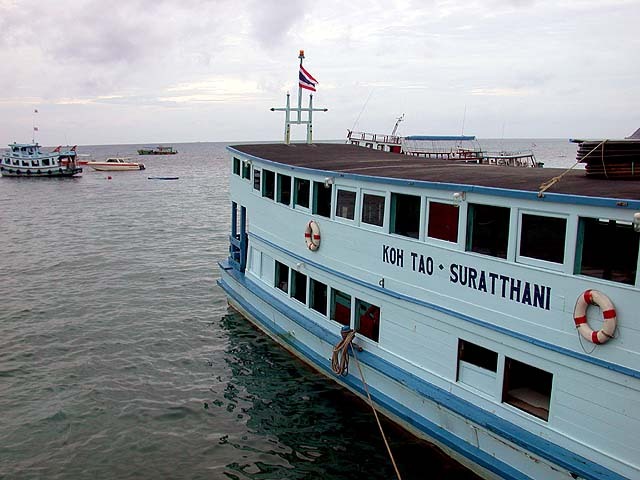 From Surat Thani there are several overnight ferries that you can take and sleep throughout the journey on basic mats side by side like sardines with other travelers and arrive at one of the three islands in the early morning. I decided to start in the north with Koh Tao and then hop between the island. And that’s what I did. 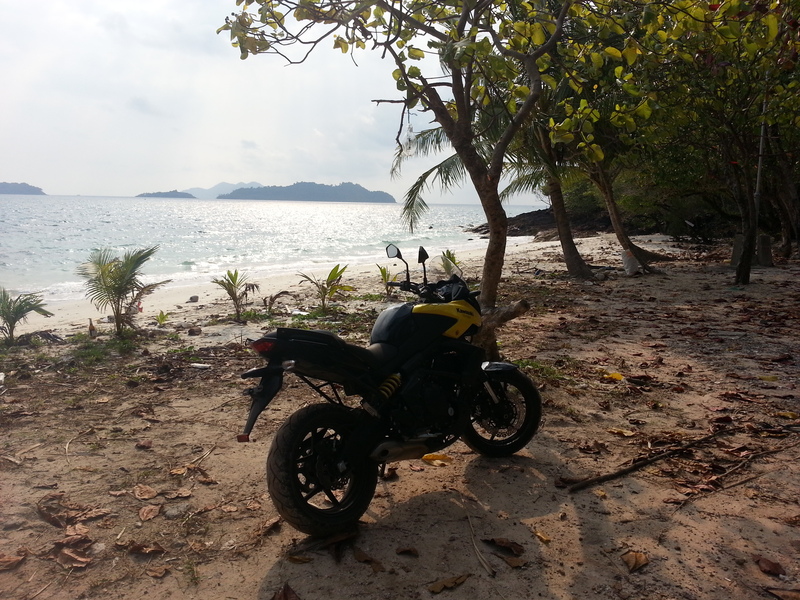 Koh Tao is a very pretty island and I hired a Honda CRF 250 trail bike to explore and get around. Beware though! There is a scam going on across Thailand where the bike renters take your passport and only return it if you return the bike in the original condition it was hired in.. or they say it was hired in! Of course, many people either crash or drop their scooters and motorcycles and only get their passports back when a huge payment for damages has been made. Some of these payments are significant and the cause of many disputes, but the police are all in collusion with the bike hire operators and so the unfortunate bike hirer is on a hiding to nothing. The bike renters also try and charge for existing scratches and scraps and so the wise technique is: firstly to find as reputable a bike hire firm as possible (not always easy); secondly, to photograph the entire bike and all its faults and scratches and show this to the vendor so that he knows you are on the ball; and thirdly, if at all possible leave a cash deposit rather than your passport. Leaving your passport with someone you don’t know in a foreign country isn’t a very wise thing to do. It can be stolen or replicated and you could find your passport being used for all sorts of scams and frauds, even involved in human trafficking and illegal immigration as was discovered during the investigation into the disappearance of Flight MH370 – which happened to occur very near to where I was in Koh Samui at the time. Most tourists, especially young girls seemed to have “Thai Tattoos” on their arms and legs. Not the Chinese characters for “wardrobe” or some other lost in translation hieroglyph, but cuts and large grazes due to coming off their hired scooters. Why? Because basically they have little or no skill riding motorcycles and initially they think its easy until they inevitably hit a patch of gravel or find they can’t slow down fast enough on the windy bends coming down the steep hills and gacross most of Koh Tao. Some of the accidents were more serious, especially because many of the tourists don’t wear helmets, or wear poor quality helmets that are not properly secured to their heads. The local ambulance service was certainly fully employed racing to and from the hospital and various accident scenes. Koh Tao is also famous for diving and I had several scuba dives while I was there. There are many dive centres and it seems you are spoiled for choice. Pretty good facilities, good diving gear, but very crowded. I have my PADI advanced open water certificate, but I am not a very experienced or well traveled diver. That said I thought the diving around the Red Sea in Egypt was much better and had prettier fish than Koh Tao. A day or so later I took the ferry to Koh Pha Ngan which is a magnet for hippies and ravers as it has the full moon beach parties, and even half moon beach parties. I never went to one, too old, don’t like smoking, and basically couldn’t be arsed, but I did find the rest of the island very interesting and I hired another CRF 250 and explored the road less traveled. Because many of the hippies and partying foreigners seem to treat the island rather disrespectfully, I did notice that the locals were not overly friendly and only smiled when they were relieving you of your cash, if indeed they smiled at all. Very un-Thai like. Blackie later told me that most of the Thais on Koh Pha Ngan are not indigenous to the island and perhaps should be a lot more grateful for the incomes and livelihoods they make from the lucrative tourism industry. In any case, Koh Pha Ngan is a not bad place by any means, but is perhaps my least favourite of the four islands I visited in Thailand. 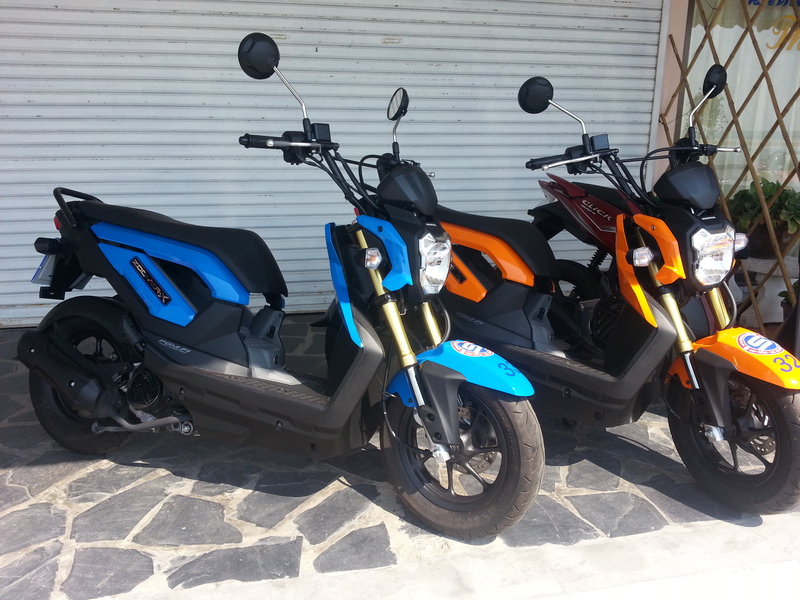 I hired a funky Honda Zoomer X for just a few baht a day. This scooter has a 108 cc engine and is absolutely superb. It looks good, very well built (it is a Honda after all), is technologically quite advanced with a hi tech automatic transmission, easy to ride, surprisingly fast, sips fuel, comfortable, space to store a helmet under the seat, and to my mind the perfect run around city bike. 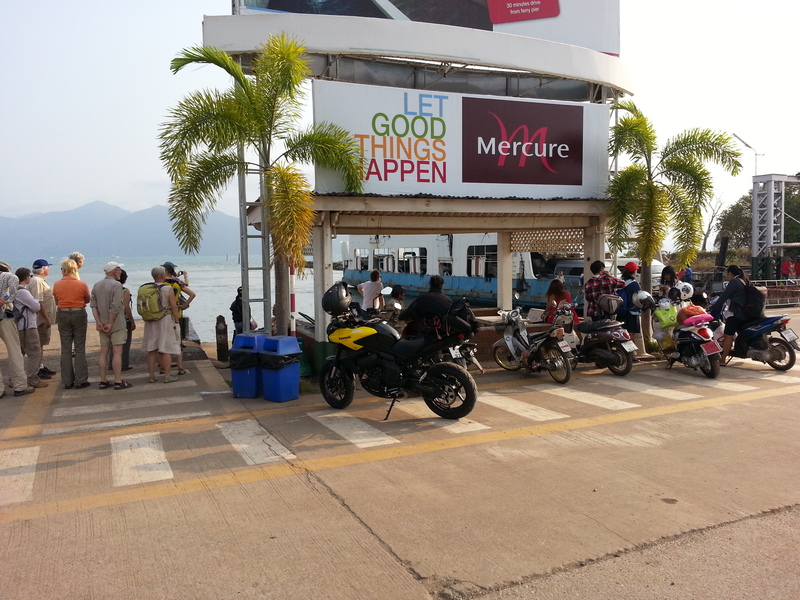 I have no idea what this picture is about…must be Koh Chang as the Kawasaki is there. 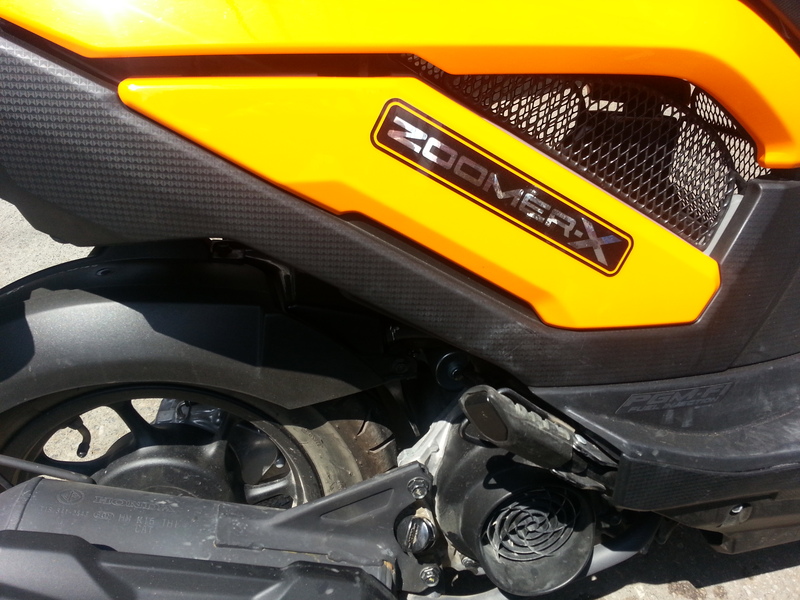 Honda Zoomer X …. love this bike. Koh Samui …. on another Honda Zoomer. Love this bike. Aaah , lunch. Tres Bien. Super beaches in Thailand , although becoming noticeably more polluted over the years. I managed to ride up into the mountains, ride on rough gravel roads in the interior jungle and find charming little beach bars, one claiming to have the greatest selection of Belgium beers in the whole of Asia. My only regret was that Fanny was not with me. I had a reasonable amount of free time as I was working on a project basis for various investigation firms in China, but Fanny had a full time job at the time. However, this was to change for me and I was hired by a Asia Pacific professional services firm called Censere and had a start date which meant for the first time in three years I would have a full time job and they would expect me to go into work “every day”!!! So, a month or so later, just before I started work Fanny and I flew to Chiang Mai, and in addition to some emergency dentistry that had been neglected of the previous three years, we decided to ride the Mae Hong Son Loop, all 600 kilometers and 1,864 switchbacks and corners through the jungle, forests and plantations and rode close to the border with Burma. 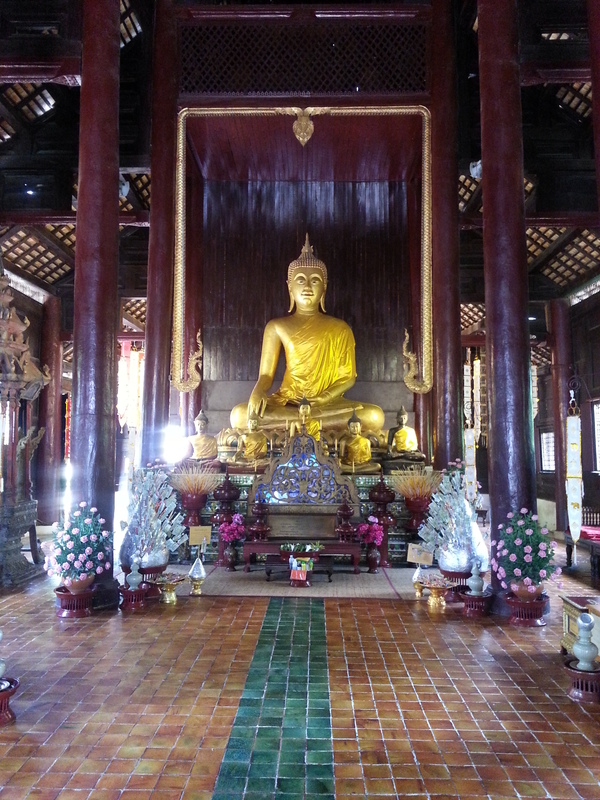 We visited Pae, Doi Inthanon National Park, Wat Phra, and Vachiratharn waterfalls. 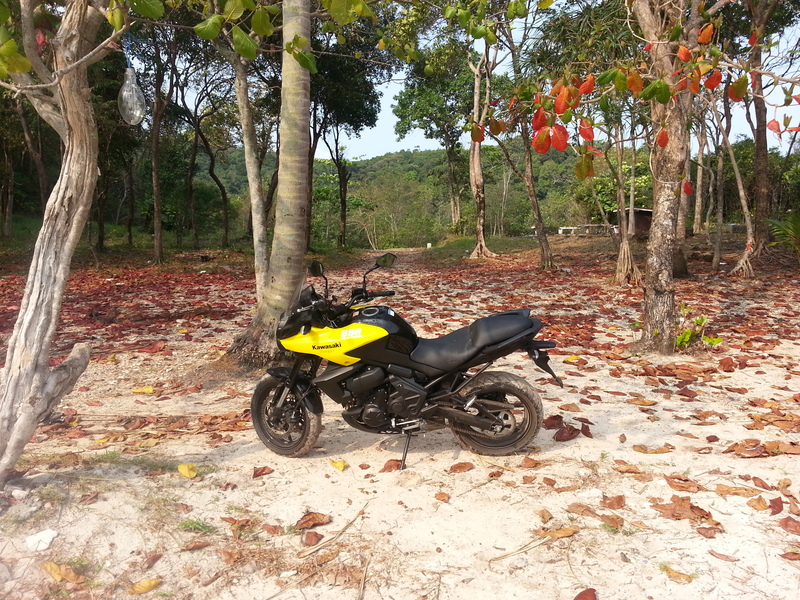 This time we hired a Suzuki V-Strom 650, a bike only recently imported into Thailand and I have to say another very good bike and a bit of a surprise. Quite large in size and high spec with a 19 inch front wheel and 17 inch rear, 66 BHP in power, and designated as a mid sized dual purpose bike. Perfect for the two up trip through the mountain roads with a North Face bag of luggage. Not a very fast bike, but fast enough. The first place we got to was Pae, famous over the years for being on the hippy trail, and indeed quite a few of the banana pancake and lentil eaters still wandering around in their hippy uniforms. 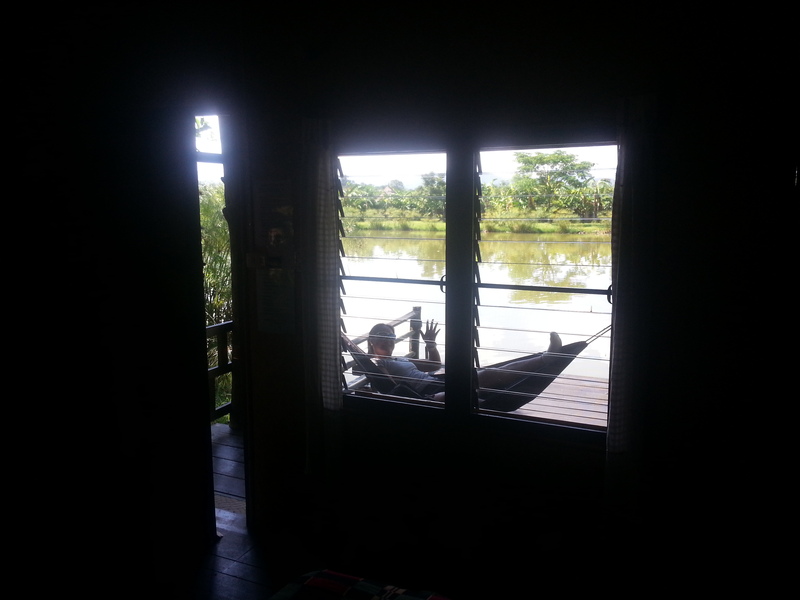 We rode slightly out of the town and found a resort called Bueng Pai Farm on the banks of a big fish pond run by a very mellow, but hard working Japanese woman who had settled in Thailand. We hired a bungalow on stilts above the lake, together with fishing rods to catch carp and perch and then release them back into the water. These fish earned their keep by being caught several times a day. Quite alarmingly, I suppose for the first time, we saw that the resort was infested with water snakes that were quite large and quite fast. Our host said she encouraged them as they were part of the ecology and that they were not “very” poisonous. Ah hem! Bueng Pai Farm prides itself on being organic and environmentally friendly and we had a swim in their naturally cleaned pool and before we set off again had their signature breakfast of some of the best mueslis, eggs and toast I have ever eaten. Super riding route. If you don’t fancy a DIY trip, you can join an organised group to riding in north Thailand, including all the bikes, hotels, and a knowledgeable guide. 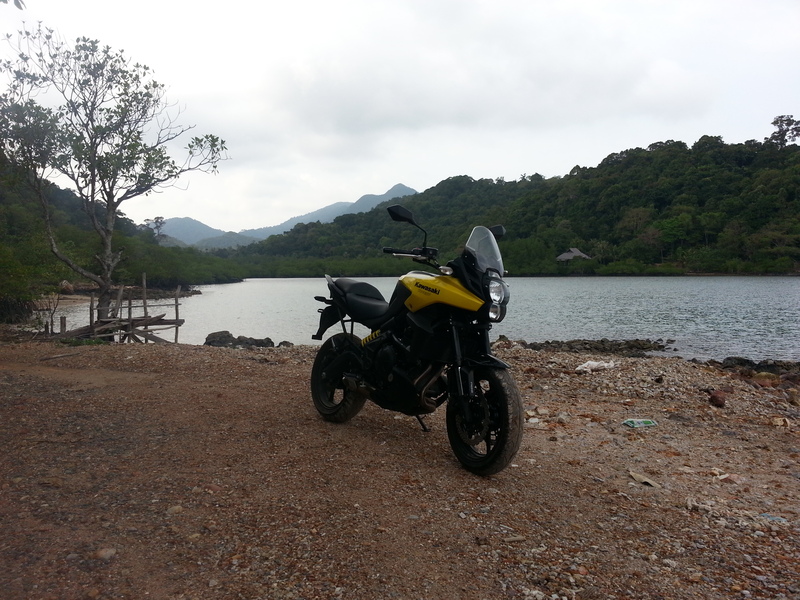 A brand new V-Strom from Chiang Mai. 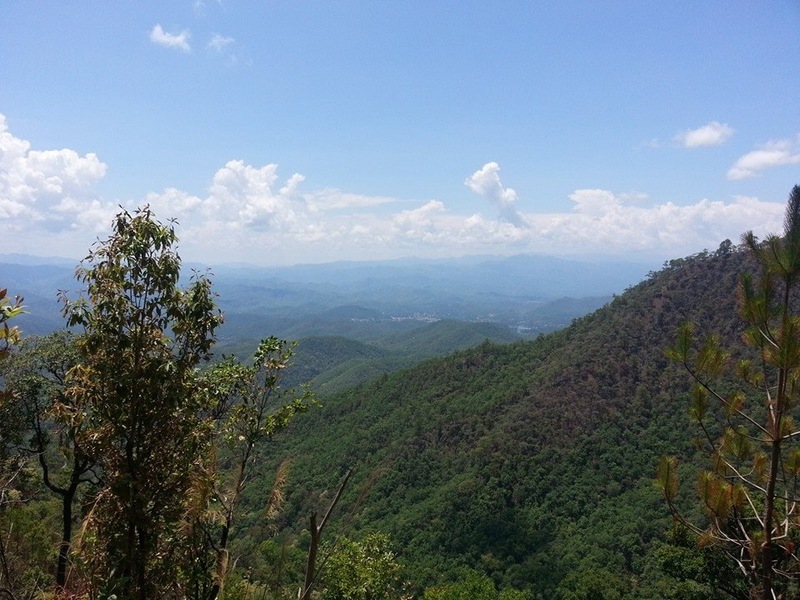 Some people said its too big for Mae Hong Son loop, but two up with Fanny no worries at all. Good bike to hire. Makes a change from wallowing in rivers and lakes. 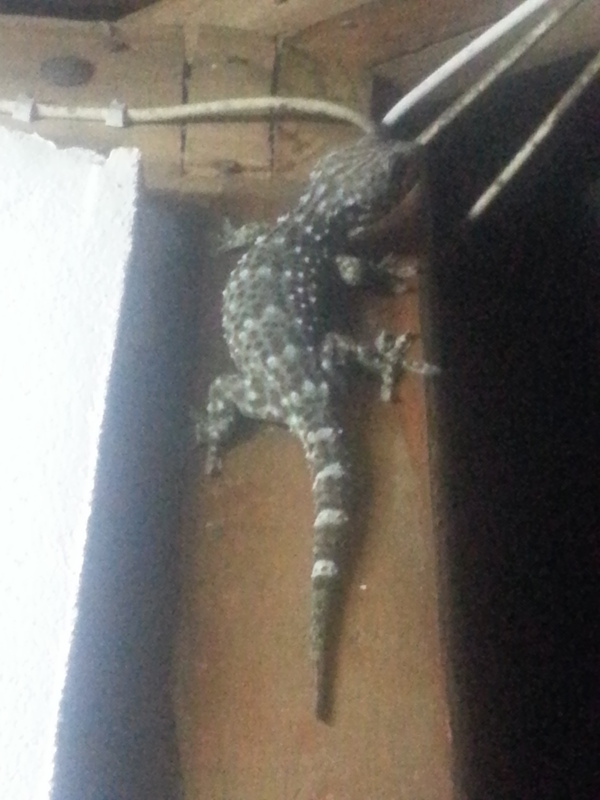 This big chap (about a foot long) was outside our hut making a loud clicking noise. Fanny and I doing the tourist thing around the old town… Seems you can’t have too much gold. Swapping the Suzuki V-Strom for another Honda Zoomer -X scooter to explore the city. We carried on through the jungles the next day and then started to swing south again near the border with Myanmar where we started to see signs for the “long neck people” village. A bit of a controversy as some people saw this as exploitation of a minority tribe and in effect a human zoo. However, when we got there it was clear the exploitation was the other way around and that the tourists were getting ripped off. Based upon posters depicting some old dear with an unusually elongated and brass ringed neck and the accompanying historical narrative, a tribe of displaced Burmese did cross the border into Thailand and settle in a refugee camp. And the women did, by tradition, keep adding rings to their neck as they grew up until they were giraffe like in appearance, much like tribes we saw in Kenya. But over the years the tribe had slowly integrated into Thai society and the traditions had slowly faded out. However, not to miss an opportunity to make a few buck some of the girls do have rings round their necks and wear traditional clothes and display themselves to paying tourists who are bused in on day trips. Fanny and I were of course on a motorcycle and as is our common practice we took a short cut to the village along the country trails and approached the village from another direction. Along the way we saw the girls getting ready for their day in the “long neck” village and getting out of their modern Thai clothes and into traditional garb. They did have rings on their necks but only about four or five and probably as many as you or I could put round our necks if we wanted to. I asked Fanny if she wanted to go and look at the village and she did. I was partly annoyed at the rip off, partly indifferent, and wholly disinclined to spend 5 dollars to go and have a look at a “human zoo” and so I stayed in the real village and looked after the bike and our kit while having a drink with the local touts and villagers. Fanny paid her entrance fee and went off only to come back 15 minutes later and tell me that it was indeed the same girls we saw earlier who were now selling tourist crap at some stalls in the village. Any really long necked women? Apparently not, and so we headed off with a new goal to find some elephants and waterfalls, and more importantly dinner. We found a rather luxurious resort and were very pleasantly surprised to be offered a very nice suite at next to nothing. In fact the whole resort just had Fanny, myself and about 30 staff in it. Why? 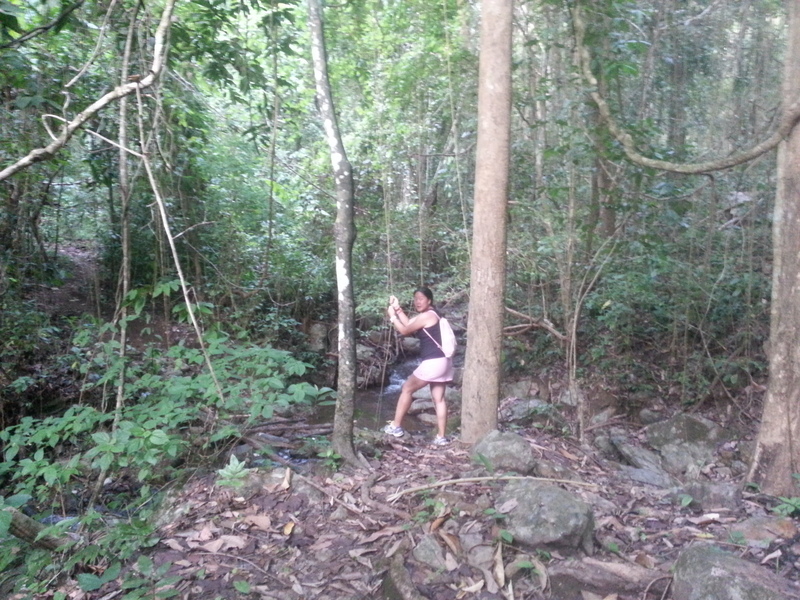 Well just before we arrived in Thailand there was a military coup and this had obviously put “normal” people off. As veterans of riding into revolutions in Africa and the middle east on our motorcycle expedition we realized this meant everything would be cheap and negotiable and Thailand was just the same. Its a country that thrives on tourism and does it very well, but when the tourists stop coming it becomes extremely competitive and huge savings can be made if you are bold enough to ask for them. There was also a curfew which pretty much coincided with the hours Fanny and I are fast asleep, and in any case the curfew got shorter and shorter over the two weeks we were there until it was irrelevant. There were quite a few soldiers and police milling about in Chiang Mai itself, but for the large part the military coup and curfew went unnoticed. 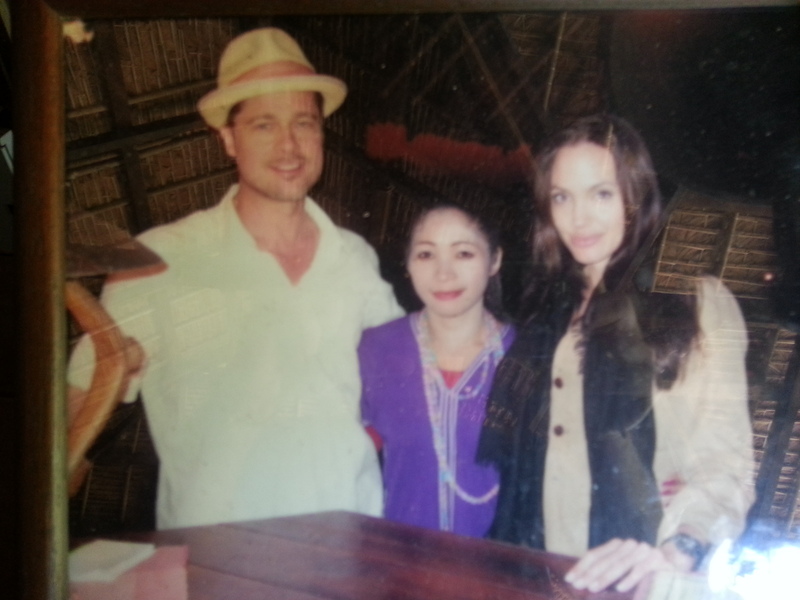 Anyway, this resort’s claim to fame was that Angelina Jolie and Brad Pitt had stayed recently, no doubt while Angelina was collecting more ethnic children for her collection. Interestingly, it was not the first time our paths cross on our expedition as we were next door neighbours to the Pitts when we stayed at my aunts house in Provence, Southern France for a while. We continued on our windy, up and down journey, passing through rain forests and small villages, but also alongside huge stretches of land and hillside where the rainforest had been slashed and burned to such an extent that all there was left was red soil and blackened tree stumps. The scale of deforestation was a bit of a shock. We were riding in the dry season, but judging by the recent soil erosion and rivers thick with red sediment, the lack of vegetation holding the top soil together must be extremely harmful to the environment. In some areas we saw attempts to start palm oil plantations, but the topography and severe soil erosion was hampering their efforts and all that was left looked like the surface of Mars. 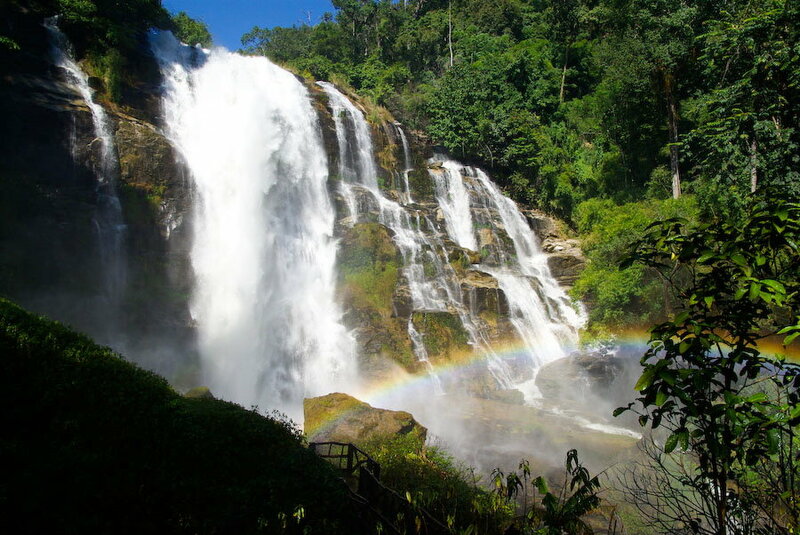 We visited some beautiful waterfalls, stayed at a few basic lodges and eventually returned back where we started in Chiang Mai. 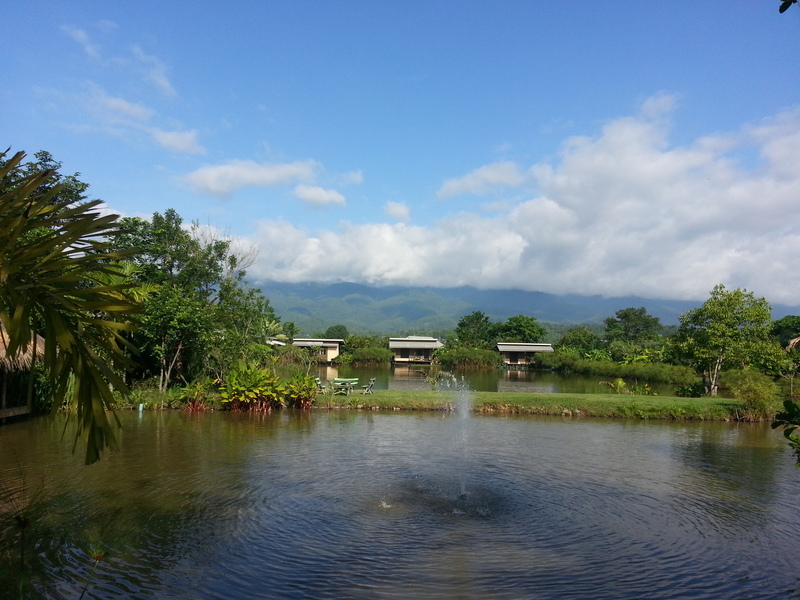 Our last day was back in the resort we stayed in called Viang Thapae Resort, which was pretty nice. We dropped of the Suzuki V-Strom which had been an excellent bike for our 6 day trip around the “loop” and hired another Honda Zoomer-X scooter for a day to get around Chiang Mai and explore the old town and street markets. Our only negative experience on the whole trip was getting stopped at a road block and being shouted at by a Thai Policeman because I wasn’t carrying my driving license and passport and he was clearly in a bad mood, probably because of the long hours he had to work throughout the curfew. I was humble, apologetic and pleaded ignorance and he calmed down and let me off. We then spent our remaining day exploring the old part of the town and eating street food in the night market. Finally our time was up and so instead of taking a taxi, we hiked from our hotel across town to the airport and within a few hours were back on Lantau Island in Hong Kong. 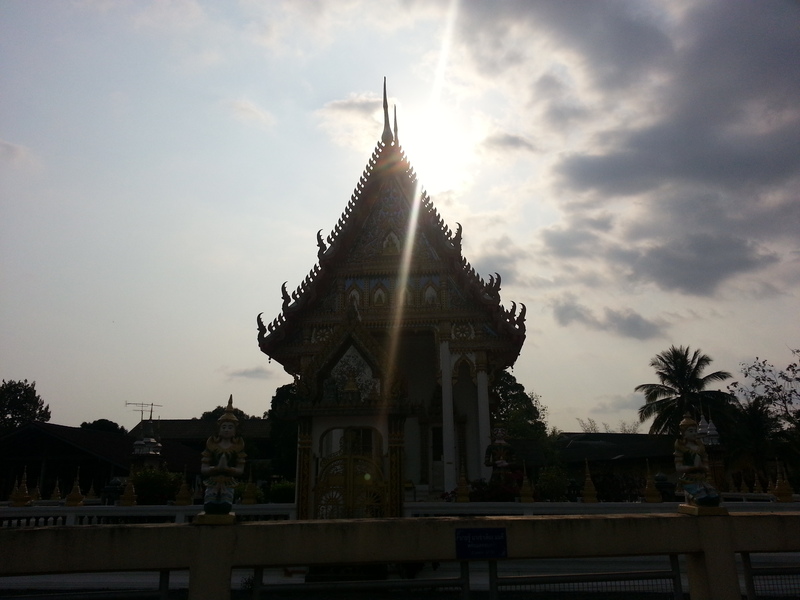 This entry was posted in Asia, China, Fanny, KTM, Places, temple. 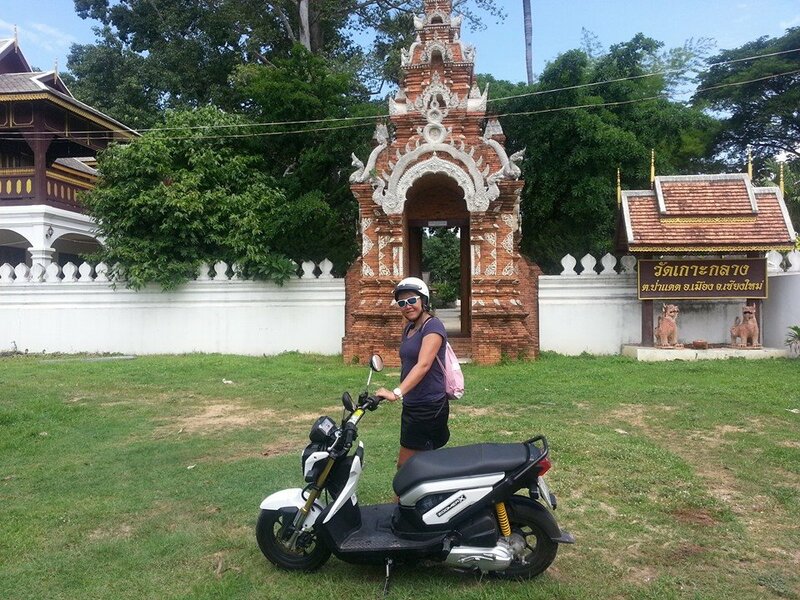 Tagged Bangkok, Chiang Mai, Elephant, Fanny, full moon, Honda, Kawasaki, Koh Chang, Koh Samui, Koh Tao, Pataya, Thailand.